2008: Switched from uniform number 13 to number 2. 2007: Did not suit up during season....played for Madison Mallards of Northwoods League during the summer. 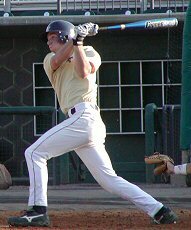 2006: Played in a total of 22 games as a freshman while backing up Mike Trapani at second base....drew two walks in his first game against Georgia State (2/15)....had an RBI single against Kennesaw State (2/19)....Went 2-for-3 with a run scored in his first start against East Tennessee State (2/21)....Had a double and scored a run in Tech's 22-4 win over Clemson (4/16)....Singled and scored a run against Duke (5/24)....Had a hit and scored two runs in his second start of the season, helping Tech to a 12-3 win over College of Charleston (6/10) in the NCAA Super Regional. Switch-hitting infielder who joined the program for 2005 Fall practice....graduated early from Centennial High School after hitting Fulton County-leading .485 with nine doubles and 15 stolen bases to earn second team All-Area honors from the Atlanta Journal-Constitution while helping Centennial to a No. 7 ranking in AAAAA and advancement to the second round of the state playoffs in 2005.....also hit .331 as a sophomore in 2004....A two-year letter-winner for coach Billy Nicholson at Centennial....played for Atlanta Blue Jays during summer of 2005. Personal: Ryan Spencer Tinkoff...Born Aug. 29, 1987 in River Edge, N.J....Son of Jay and Denise Tinkoff....Was the state of Georgia Tennis Champion at the age of 12 and earned rankings of No. 1 in Georgia, No. 2 in the South and Top-10 in the nation in 2000....Dean's List student majoring in Management....Named to the 2006 ACC Honor Roll.